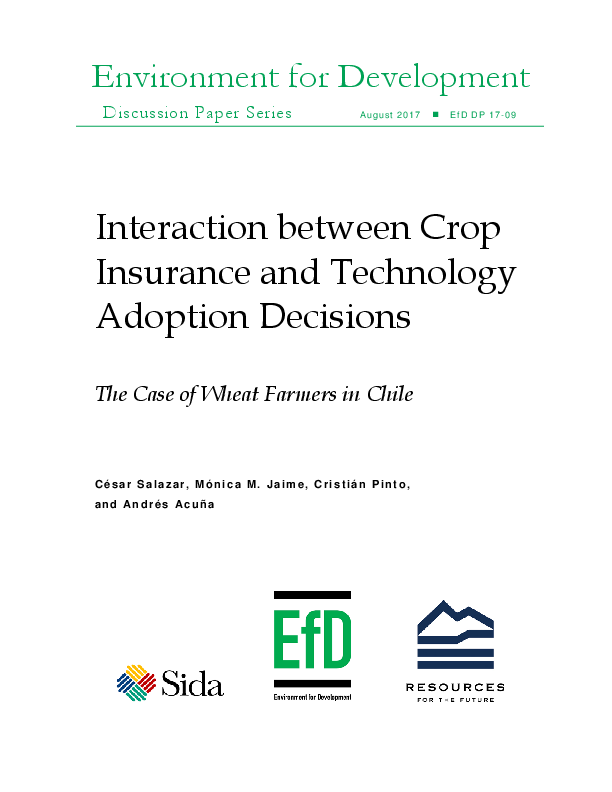 This paper examines relationships between crop insurance participation and input technology decisions among Chilean wheat farmers. Using nation-wide farm-level data from the National Agriculture and Forestry Census (INE 2007) a bivariate probit model is estimated. In this regard, we investigate the extent to which the adoption of certain production input technologies is associated with the participation of farmers in the state-promoted agriculture climate risk insurance program. We find that relationships between insurance and technology decisions are significant among family farmers, but this is not the case for large-scale farmers. Evidence also suggests that modern irrigation reduces the likelihood of adopting crop insurance, suggesting that Chilean farmers perceive these two options as substitutes. The latter implies that those using traditional irrigation methods preferentially participate in the insurance program, which can be taken as evidence of adverse selection in the Chilean insurance market.